The sound is always turned on which can be a con in some situations. First time parents can’t even imagine how tricky some things will get once their baby is born. Trying to keep everything under control will probably be harder than than they initially imagine. This is where video baby monitors can help you go about your chores and still be able to always keep a watchful eye over your child. The video monitor that we’re going to look closer at in this review is the Motorola MBP36S. 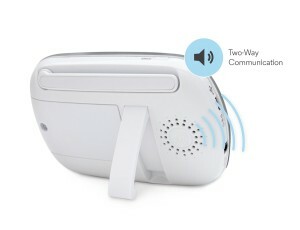 It’s a monitor that will enable you to always keep a connection with your child, as much video as audio. In fact, one of the biggest advantages is the clear voice transmission, that can go a long way in helping you take better care of your baby. Probably one of the greatest benefits of the MBP36S is the two-way communication capability. It’s very clear, so you can easily talk or sing to your baby, besides hearing everything that’s going on at the other end. The transmission is encrypted, which offers a heightened sense of security. As much as the signal strength is concerned, you will be able to have a high-quality signal up to a distance of 590 feet. So, it’s a great choice if you live in a bigger house. If you pass that distance, an alarm will sound letting you know exactly when you get out of range, so there are no worries on your part. 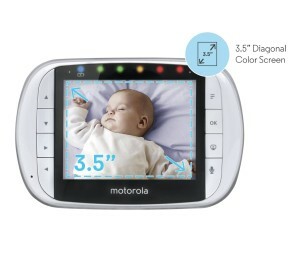 The screen has a diagonal of 3.5 inches, it’s full color and has live video and audio transmission from your baby’s room. On the top of the screen, 5 LED colored lights show you the noise level in your baby’s room, so you not only hear what’s going on, but you can see it. Another great feature of the parent device is that you can pan, tilt and zoom as needed, remotely. In addition to the above mentioned benefits, there are further features that might come in really handy at times. The camera has a built-in room temperature monitor, so you can adjust accordingly when needed. The infrared night vision capability, is perfect if you want to check on your baby at night without turning on the lights. If your baby only needs a gentle lullaby to go back to sleep, there are 5 of them built-in. 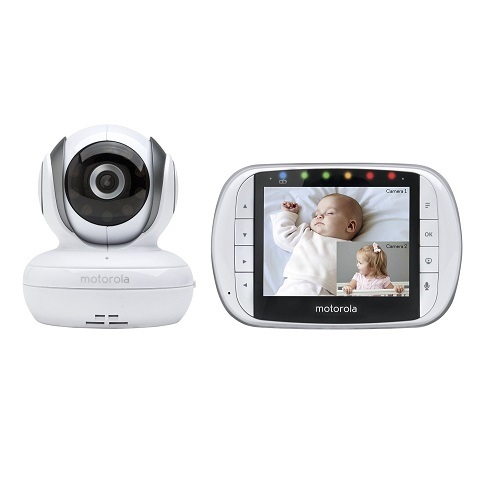 If you have 2 children of different ages, and would love it if you could monitor both at the same time, than you will probably like the fact that you can attach a second camera to your parent unit. You can see all your cameras simultaneously on a split-screen, or you can set it to go from displaying the view of one camera after the other. Most reviewers of this video baby monitor loved the features that this generation of Motorola baby monitors have to offer. The temperature sensor, night-vision capability and two-way talk were some of the most mentioned pros of this product. The majority of parents who used and rated this monitor said that they were very pleased with the level of quality concerning both audio and video transmissions. They particularly liked the two-way transmission, because they were able to not only here their child but they could also speak to him through the monitor. To further help you sooth you baby from a distance, the manufacturer included 5 lullabies, to be use in case of need. Many reviewers mentioned how easy it was to remotely move their view on the display through the room, even zoom in to see the baby from close-up. Although some reviewers noted that they lost audio while the camera was moving, most were very pleased with this feature. Just like you probably guessed it by the statistics, there were some reviewers that mentioned some weaknesses about this monitor. Some reviewers said that they would have liked an even better video quality, as far as resolution is concerned. One reviewer particularly said that he experienced a certain delay in response time when he activated pan and tilt functions. Overall, although there were some cons pointed out by some reviewers, most customers thought it was a great choice. The smart features that Motorola added too their newest generation video monitor, the MBP36S, makes it one of the best choices out there, and definitely a recommended choice. Next post: What’s the Best Baby Bathtub?